June 10, 2017 - 10 am. 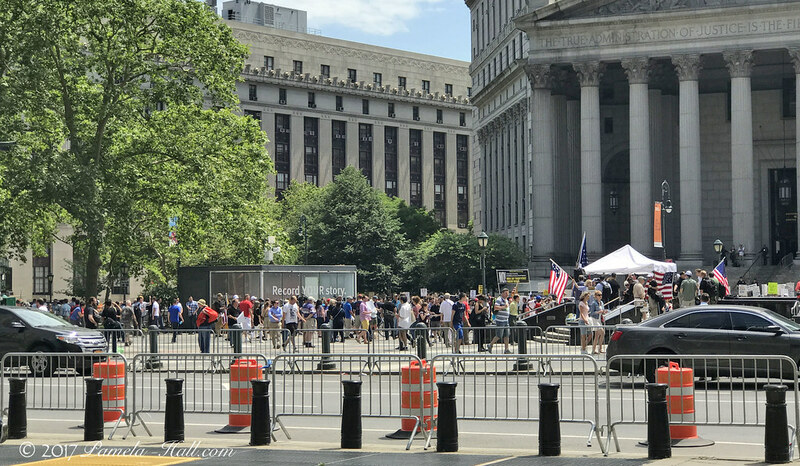 Patriots gathered in Foley Square to "March Against Sharia". 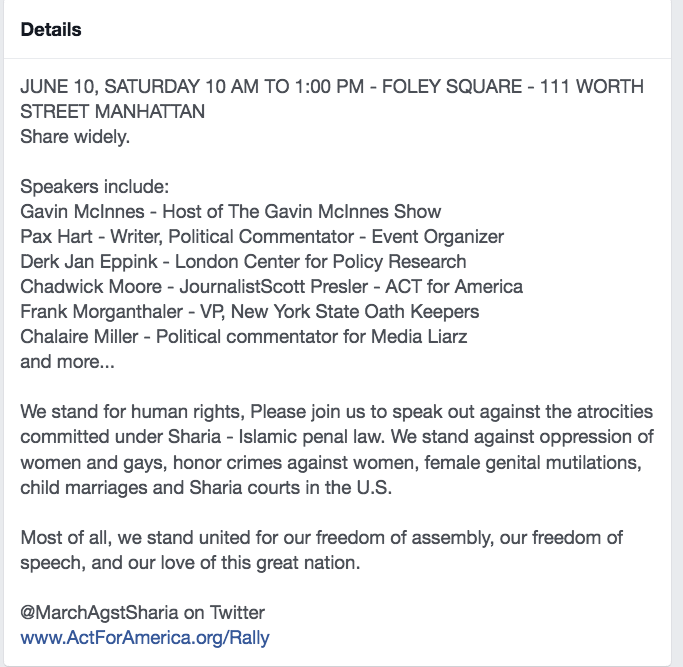 We stand for human rights, Please join us to speak out against the atrocities committed under Sharia - Islamic penal law. 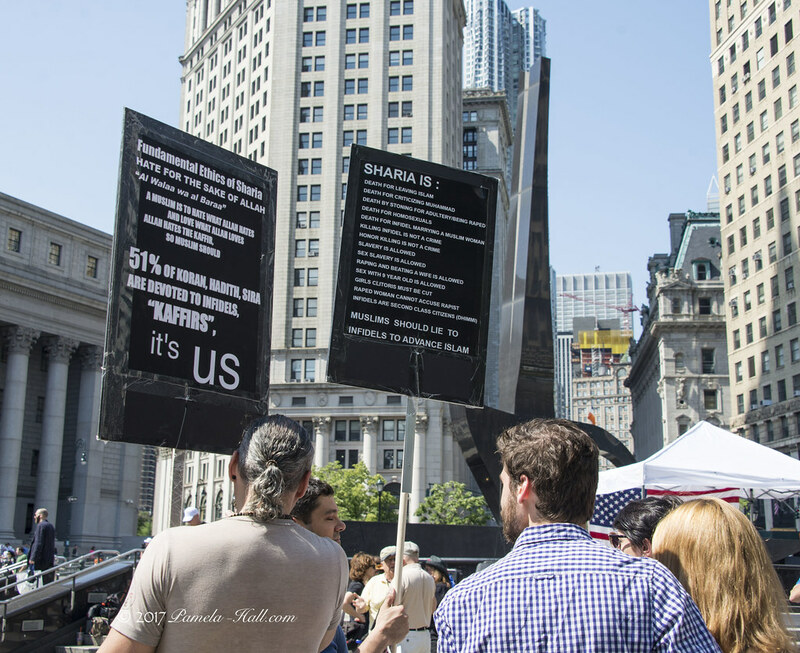 We stand against oppression of women and gays, honor crimes against women, female genital mutilations, child marriages and Sharia courts in the U.S. 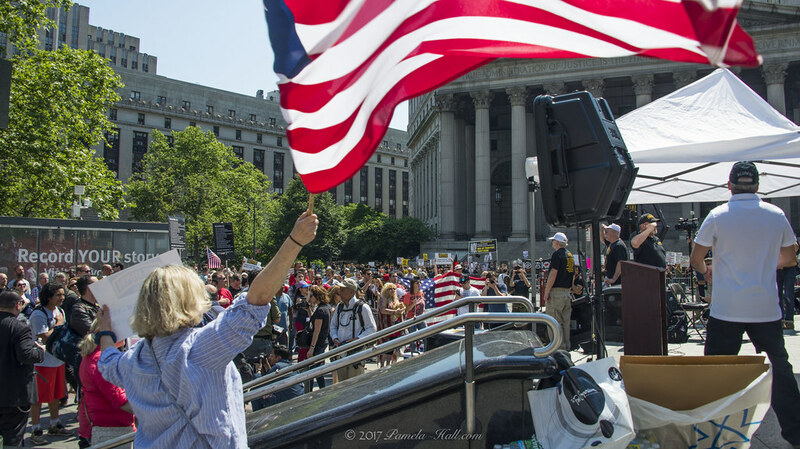 Most of all, we stand united for our freedom of assembly, our freedom of speech, and our love of this great nation. 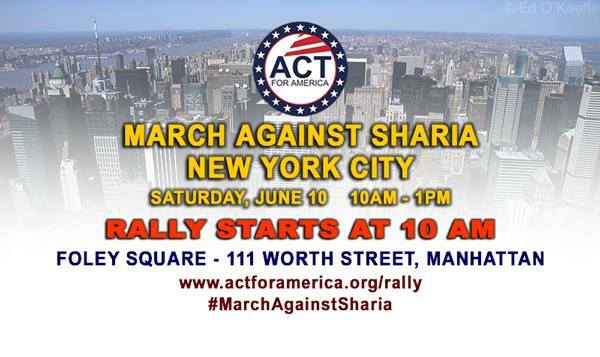 The only marching done this day was by the PRO-Sharia NOISE-makers. 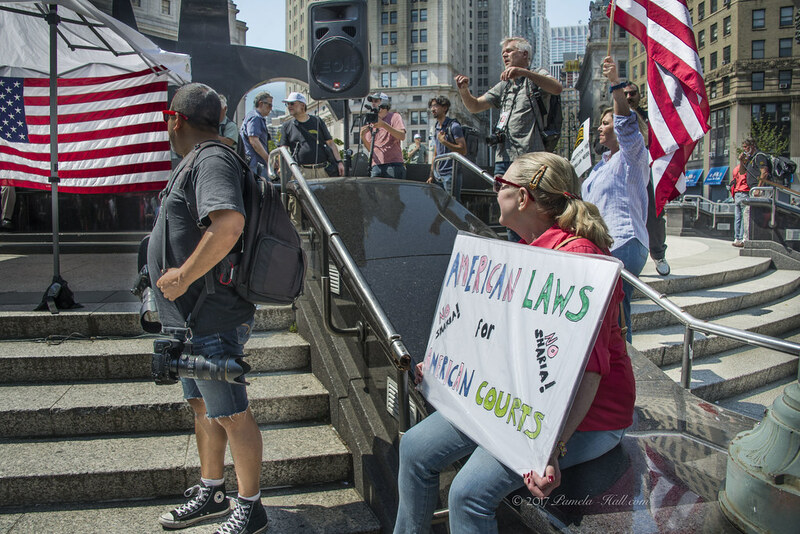 They arrived early, the PRO-Sharia Marxist/Fascist/Antifa/Socialist/Anarchists, standing in front of the court house, armed with noise makers, pots and pans, bicycle horns and air horns. 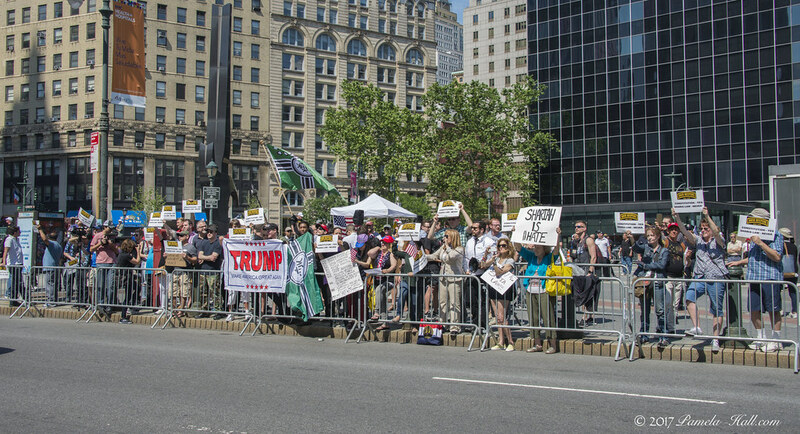 They came prepared to make war on Free Speech. Again. 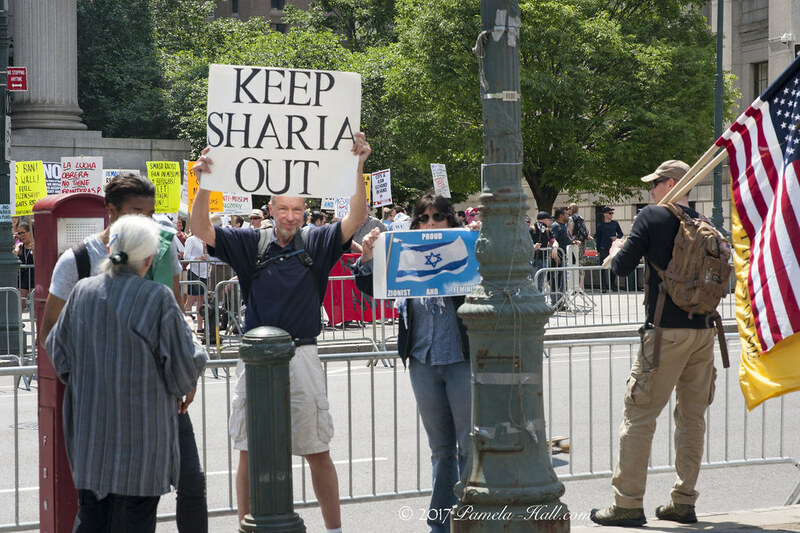 But the ANTI - Sharia patriots were not shy when it came to giving it right back at them. 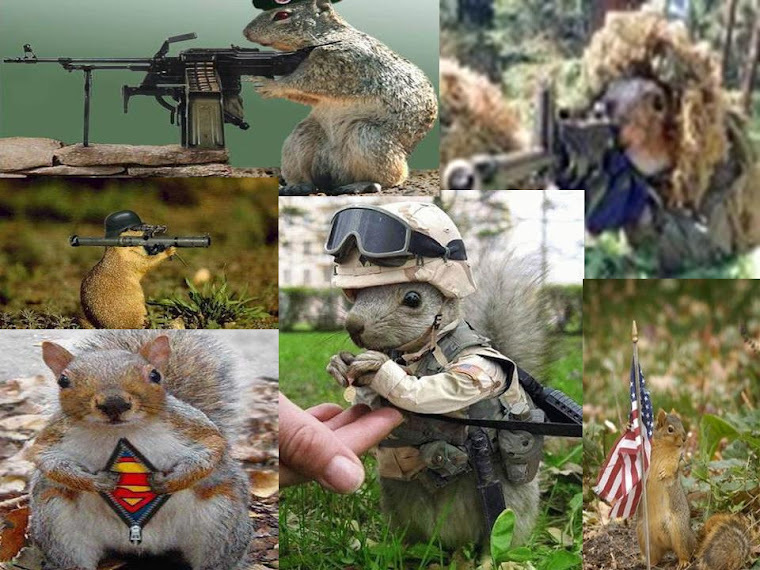 They were prepared - to DEFEND the Constitution - AGAIN. Also, have an excerpt of Madison Rising's fabulous version of our National Anthem. The rally started late, so I wasn't able to stay to catch all the speakers. The Patriots were in top form as you can see in the Flickr Slide show. They did not suffer the anarchists in silence. 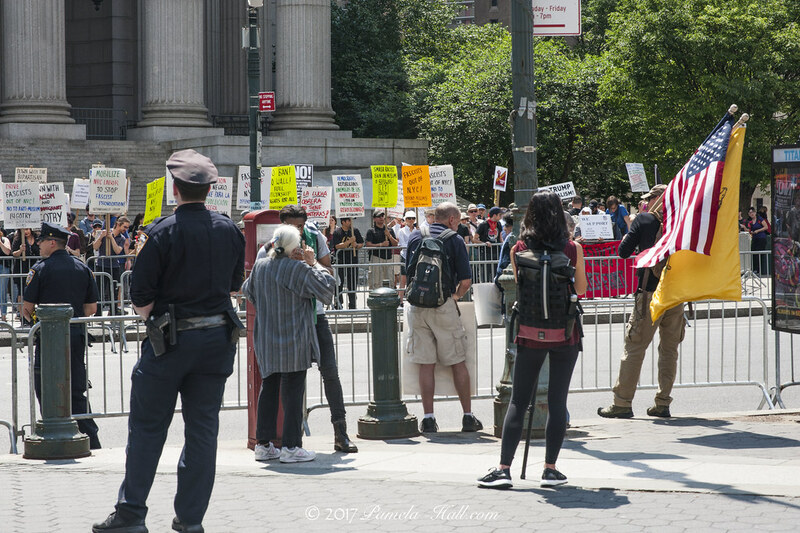 The Marxist/ Fascist/ Anarchist noise-makers were obnoxious but did not drown out the speakers as they intended. In spite of the media's misleading reports, if you stood at the staging area you could hear the speakers just FINE. 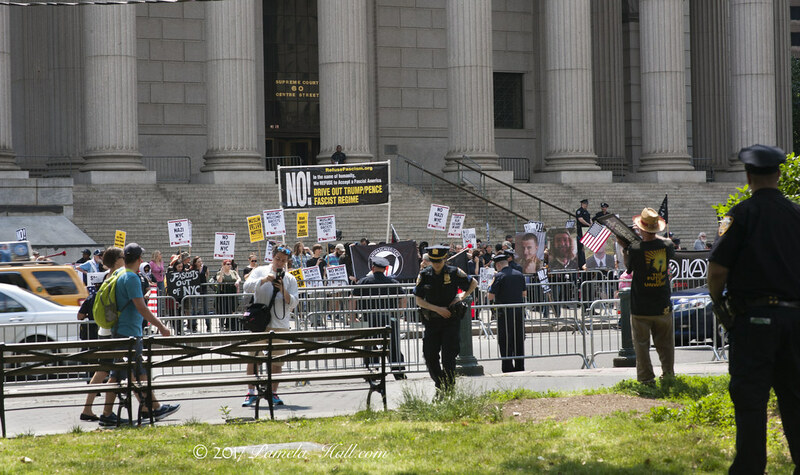 Something odd seems to have sprouted on our side, Gavin McInnes' Proud Boys, the next gen of young Americans whose brass in fighting back is challenging the Leftists. 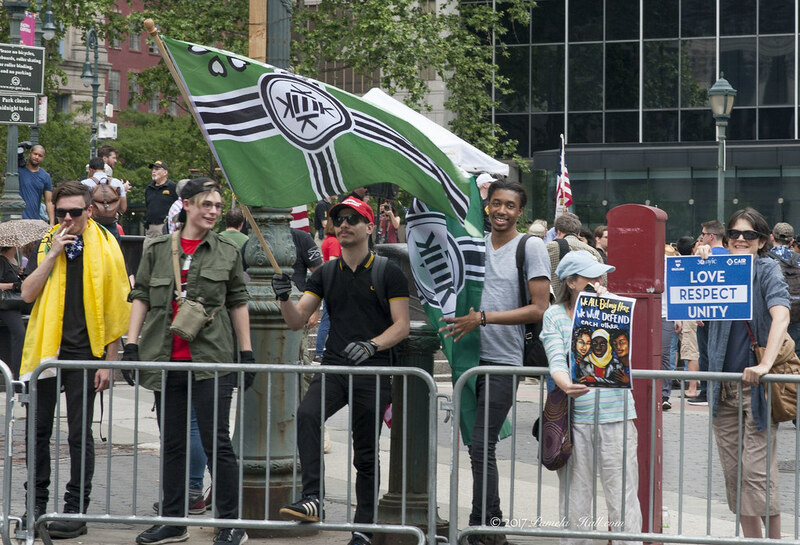 No problem for me there but, WHY do the Proud Boys wave that FAKE green flag of Kekistan. WHAT is the point? In picture after picture, what does it mean? 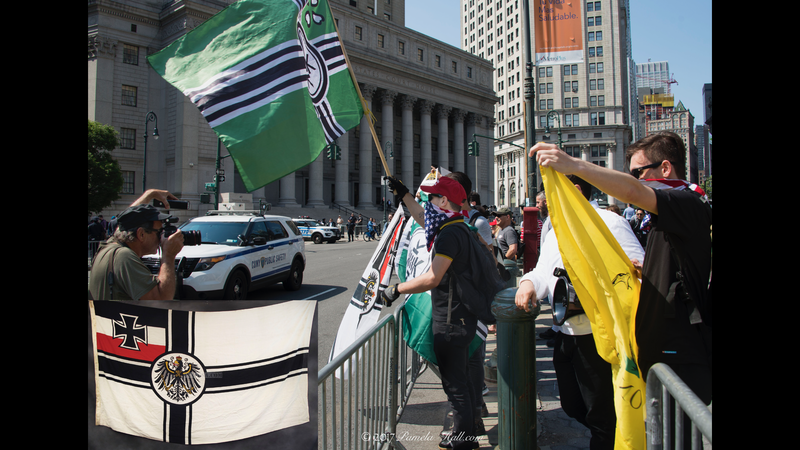 Waving a FAKE flag that some feel is a NAZI flag. Neo-Facists. White Supremacists. Shouldn't there be a purpose to their madness? And they also briefly waved the WW1 flag of Germany as well. Why? 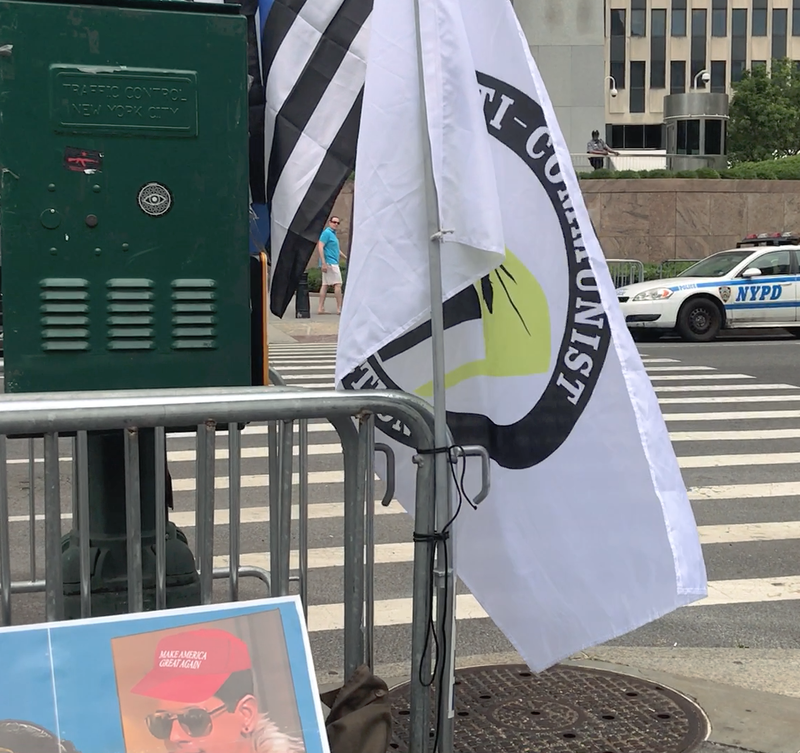 Later I saw what appears to be a Proud boys poster [magarally.com] next to their anti-Communist Action flag. 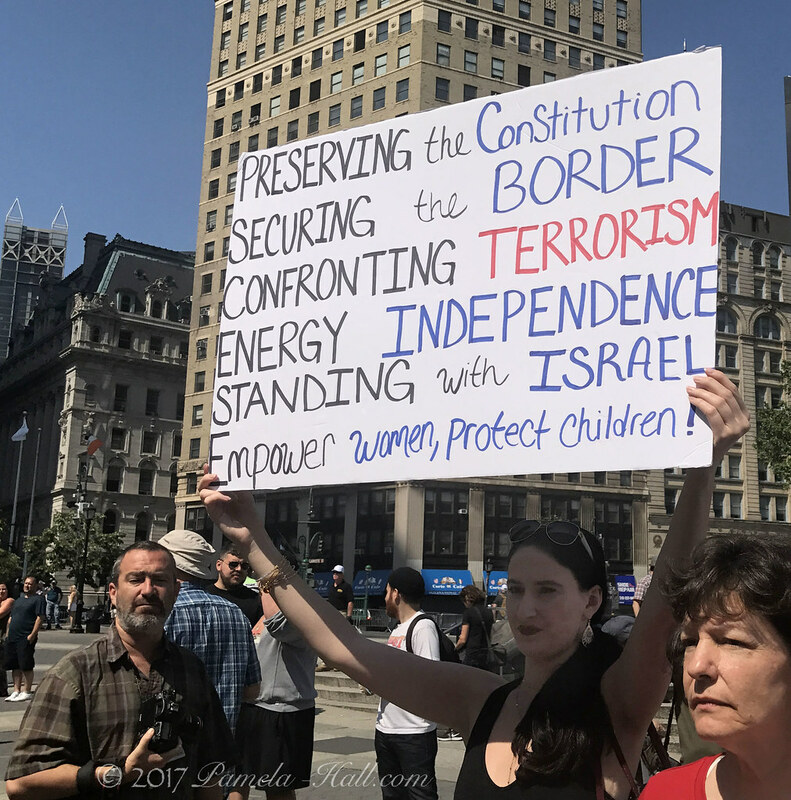 Then the poster disappeared, but reappeared in the hands of a Proud Boy. 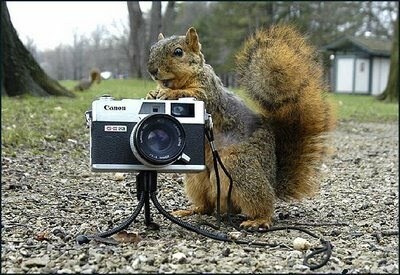 Is this kind of mockery good for our cause? Perhaps these provocative actions and posters and flags are the mistakes of youth .... but, what's Gavin's excuse? Is Gavin just a SHOCK JOCK, a wanna-be comedian whose shiz is weak ? Listening to his un-amusing speech does not make me a fan. 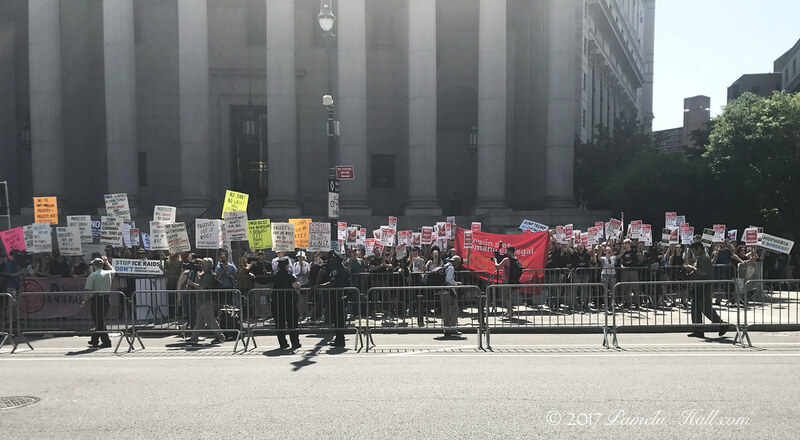 [link here] McInnes is pictured below (with goatee) watching from side of the stage at the May 25th protest. 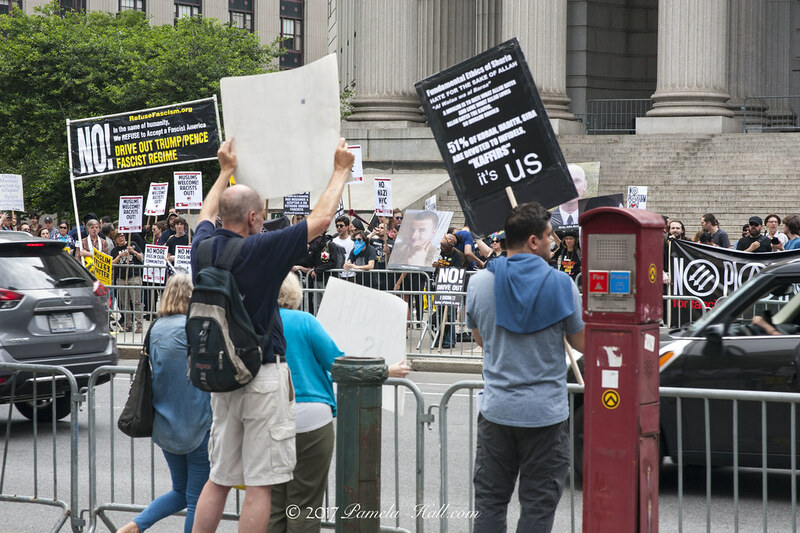 Listening, instead, to Pamela Geller (and Milo Yiannopoulos) who spoke at the very successful AFDI #SayNotoSarsour and Sharia Law protest on May 25. [LINK TO FULL VIDEO] is encouraging and inspiring. The TRUTH rang out - both days - not NOISE. 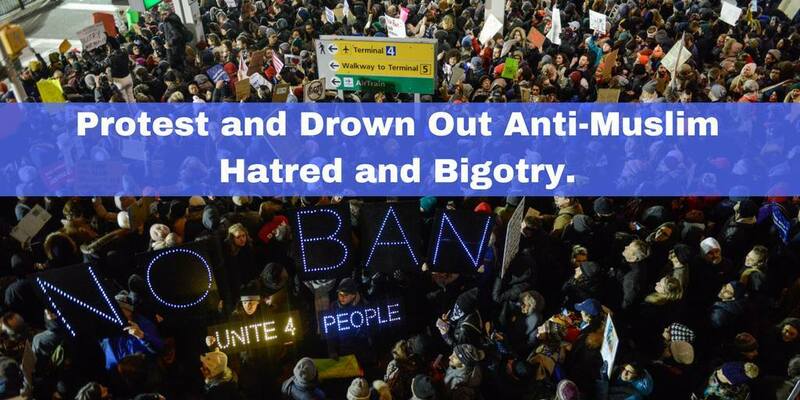 No Marxist, Fascist, Anarchist, Antifas will ever succeed in shutting down our FREE SPEECH. They keep trying, but We will NOT be SILENCED.